While the box says this is a Spartan Locus, in actuality, it’s Argus armor, with a Locus helmet attached. An Argus helmet is also included, if you so choose. This is not a deterrent though folks. This is a VERY cool looking figure regardless of which helmet you choose to have on the figure. Since I already have the Linda figure and I think the Locus is just an awesome helmet, I chose to keep that on it. The box has a large window on the front to display the figure. Instead of a build-a-figure piece, it has an extra different helmet. 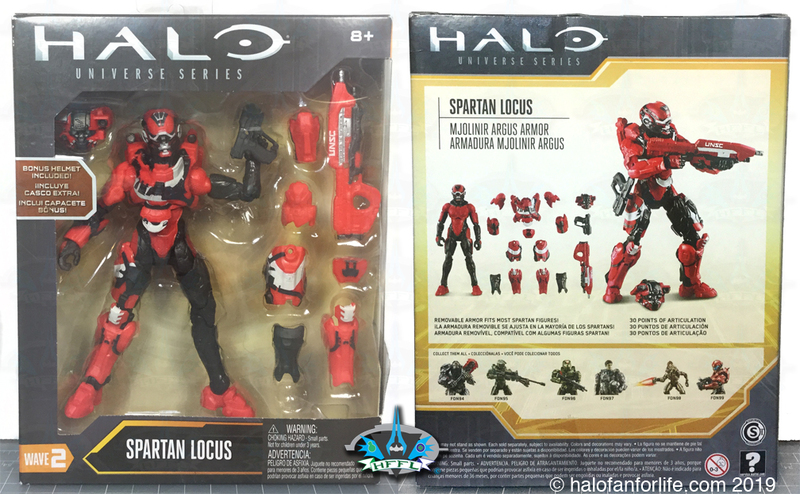 On the back it shows the different armor pieces and other figures from the first wave of Mattel Halo action figures. Categories Select Category Charity Events Conventions Fan Art / Other non-written media. General Blog Info Halo To The Players PODCAST HFFL Gaming Group Spirit Of Fire Podcast Spirit of Fire FEED Halo Collecting Halo McFarlane Toys Halo Mega Bloks/Construx Halo Minimates Mattel Misc toys, posters, etc. Halo eSports Halo Games Halo 2 Anniversary Halo 4 Campaign Forward Unto Dawn Halo Ricochet League Spartan Ops War Games (Matchmaking) Halo 5 Guardians REQ cards Warzone Firefight Halo CE: Anniverary Halo Channel Halo Infinite Halo Master Chief Collection Halo Reach Halo Wars Halo Wars 2 Halo Waypoint Canon Fodder HUNTtheTRUTH Spartan Assault Spartan Strike Halo Live Action Productions Nightfall The Fall of Reach HFFL contests HFFL Forum HFFL gaming group MaC Rounds Other Halo Fan sites Podcasts Spielberg TV show Uncategorized Written word Comic Books and Graphic Novels Fan Fic Interviews Novels Reports The Science of Halo Fact Vs Fiction What If? Please help HFFL continue to bring you entertaining Halo content. Want to be a subscriber and post replies? Please e-mail at sal@halofanforlife.com. In the e-mail send me the user name you would like. I'll set up your account and give you a password. You can change it later. Please remember your password as I will be unable to retrieve it.